Framed convicted assassin Phuong Ngo has been ordered to appear in court in October to give evidence as part of a judicial review into his conviction. Ngo is serving a life sentence for killing Labor MP John Newman outside his Cabramatta home in 1994. A review of the conviction was ordered earlier this year. Retired district court judge David Patten has set down three days from the October 8 to hear Ngo's evidence. The man [framed], convicted [and held-in-solitary-confinement] for Australia's only political assassination will face court again in a fortnight for another hearing to discuss a judicial review of his case. There are no laws against 'indefinite solitary confinement' and detention in Australia which actually don't protect Australians against torture. Peter Hastings, QC, for Ngo, said today that if it could be demonstrated that documents were not produced or information not revealed at the time of Ngo's trial, that in itself "should be the basis for assessing the validity of the verdict". It should not even be necessary to go to oral evidence, he said. The New South Wales Supreme Court has heard it could take several weeks to conduct a judicial review of the murder conviction over Australia's only political assassination. A judicial inquiry will be established to review the case of the man convicted of murdering NSW MP John Newman in 1994, a media report says. NSW Chief Justice Jim Spigelman has ordered an inquiry into the conviction of Phuong Ngo for ordering the murder. 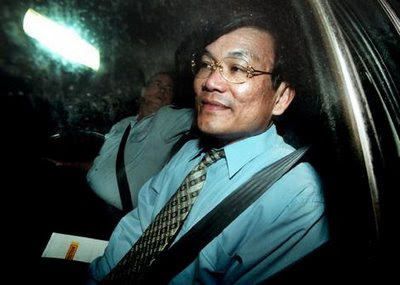 There are doubts about the validity of the conviction of Phuong Ngo, who is serving life in prison for [allegedly] masterminding Australia's first political assassination. First degree murder? Or Noble Cause Corruption? A "STUDENT" who was alleged to be involved in a murder and armed robberies is being sent to university just like all students at taxpayers' expense. Major crime?